Yak is Martin Morgan playing music in the style of 70's symph prog. The band were originally formed in 1982 and disbanded in 1984 when the various members moved to differing locations in the UK. In 2004, a CD finally resulted which consisted of 8 of the original Yak tracks performed entirely by Morgain using keyboards to emulate the 4 piece band. 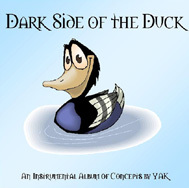 The success of this release, Dark Side of the Duck inspired most of the original members to reunite and in 2005 a live album was released followed in 2006 by another live recording.